To make your NCLI Day celebration all it can be, enlist the help of colleagues and partners in your school system and wider community. Help won’t be hard to find when others begin to understand the effort’s importance — and its potential benefits. More immediately, NCLI Day can bring unique benefits to your school community. This event, as noted above, can excite young people by shaking up their classroom routines and leading them into uncharted territory. 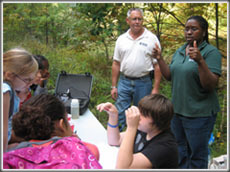 Additionally, NCLI Day can show the community a new side of your school, highlighting the nontraditional educational approaches you’re undertaking to provide students with high-quality, hands-on experiences in Earth science education. Approach your principal, your school’s lead science teacher, and your school district science curriculum supervisor about organizing an NCLI Day celebration. You might even enlist the support of your district superintendent or key school board members. Talk with your fellow science teachers, as well as teachers in other subjects such as math and social studies, about collaborative activities and cross-curricular projects. Welcome parents and guardians to volunteer at the event. In particular, if the number of students included is high, you may be glad to have extra adults on hand to manage students. And as you probably know from previous experience, these folks appreciate being included in their children’s education. Enlisting partners is a great way to share the workload. Many of the recommendations above come from AGI’s The Pulse of Earth Science: An Advocacy Guide. Feel free to consult this handy resource in maximizing your efforts to garner support for NCLI Day and your other Earth science efforts.